Fantasy Flight Games is proud to announce Whispers of Shadow and Steel, a new novella set in the world of Rokugan by Mari Murdock, focusing on the Scorpion Clan! 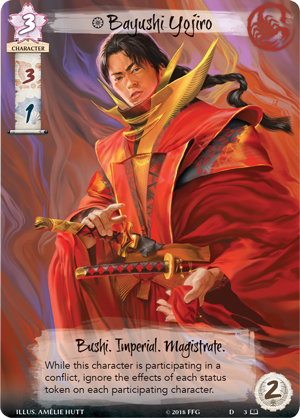 Not only does the novella feature a thrilling full-length story, but also includes two extended art cards for Legend of the Five Rings: The Card Game! Whispers of Shadows and Steel gives rare insight into the world of the Scorpion and their unique concept of duty, while a full color insert gives you a visual and written insight into the clan. 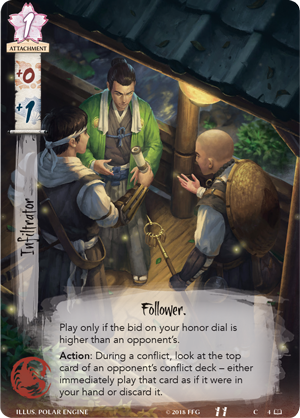 Discover the story of Bayushi’s first followers, rumors of the purely fictitious ninja that prowl the shadows, and much more. 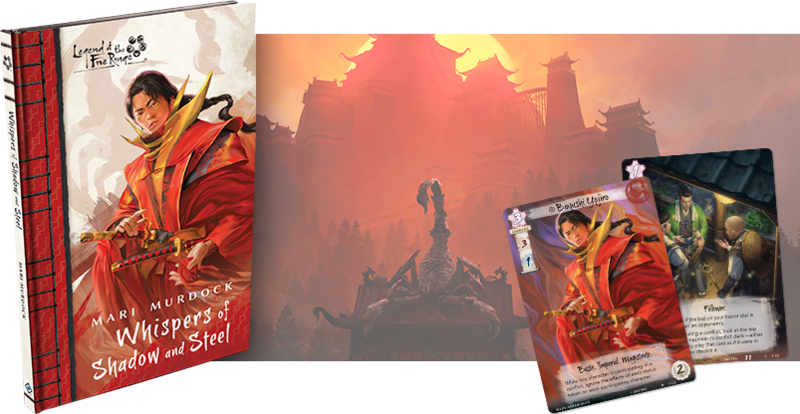 Whispers of Shadow and Steel contains three copies of two extended art Legend of the Five Rings: The Card Game cards, one from the Imperial Cycle and one from the Elemental Cycle. The story of the novella focuses on the Honest Scorpion, Bayushi Yojiro. 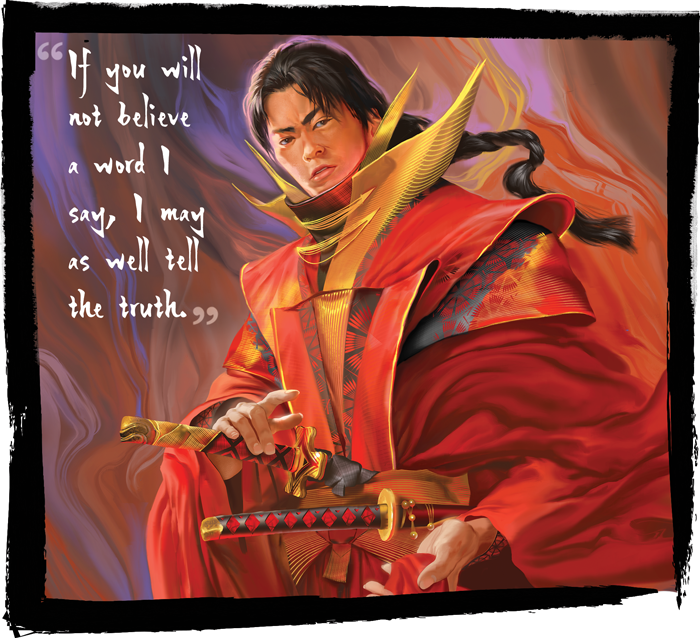 As such, one of the cards featured in the novella is an extended art version of the Honest Scorpion himself. As a Magistrate, Bayushi Yojiro alters the rules of conflicts—in his case, ignoring the effects of status tokens on participating characters. This can enhance the dishonorable Scorpions around him, and erase the bonus of your opponent’s honorable characters. Though Bayushi Yojiro is loyal in his role as a Magistrate, he still supports his fellow Scorpion in battle and in the courts. The second card included in Whispers of Shadow and Steel is from the upcoming Elemental Cycle, and showcases one of the Scorpion’s most unique talents. Infiltrator is an attachment that allows you, as an action, to reveal the top card of your opponent’s conflict deck and either play it as if it were in your hand or discard it. As an attachment, you can repeat this process every turn, as long as your infiltrator is in play, and as long as your bid remains higher than your opponent's. This allows you to infiltrate your opponent’s conflict deck and turn their very best weapons against them—a tactic well befitting a Scorpion. Duty and loyalty define a Scorpion. But when loyalties are split, a samurai must determine the best path forward. Torn between conducting a proper investigation as a Magistrate, and the need to keep the secrets of the Scorpion their own, Bayushi Yojiro finds himself in a precarious position. Surrounded by whispers of shadow and steel, what will the honest Scorpion choose? Find out with Whispers of Shadows and Steel (L5N02), available now for pre-order from your local retailer or our website!